Summary: SPX and NDX are now just 3-4% from their September all-time high (ATH). 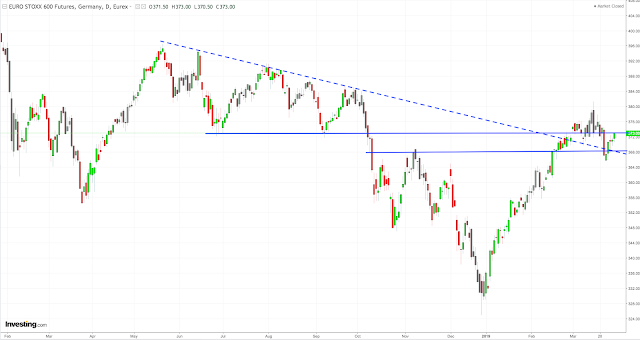 On an equal-weigh basis, NDX has already made a new ATH. 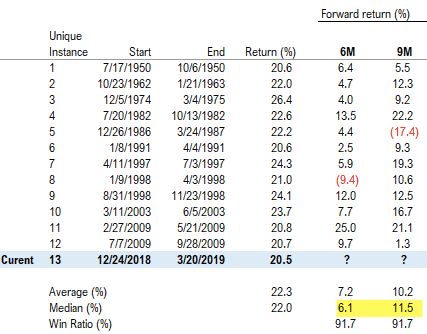 This has been one of the 10 best ever starts to a year; over the past 60 years, similar fast starts have consistently led to continued gains in the months ahead. That doesn't mean stocks will not have an interim setback. But if past is prologue, SPX is likely to gain enough to make a new ATH in 2019. Macro data weakened in the past half year. A conservative investor with a shorter time horizon wouldn't be wrong to reduce their equity holdings into strength. But the panic over weakening macro is likely to abate and, with fund managers' risk exposure falling to a 2-1/2 year low this month, sentiment supports a continued rise in equities. Since Christmas Eve, SPX is up 21%, NDX 24% and RUT 23%. Europe and emerging markets are each up 14% (table from alphatrends.net). Enlarge any chart by clicking on it. In early March, SPX reached the top of its trading range from October to early December (upper panel). It then corrected less than 3% and closed the month at 6 month high. The next resistance area is 2860-70, which it has already reached once, 6 days ago. All-time highs (ATH) from September are now just 3% higher. The index is grinding upwards as Vix stays under 16 (lower panel). It would take a close under 2600 to trigger a bearish failure. Breadth is healthy. The SPX on an equal-weight basis closed above the top of its prior range in mid-February. It's now less than 2.5% from its September ATH. It has led. Nasdaq breadth is even better. The equal-weight NDX made a new ATH two weeks ago. Put another way, FAANG stocks are holding the indices back; given their heavy weighting, if they kick into gear, the traditional market capitalization-based indices will likewise move back to their ATHs. 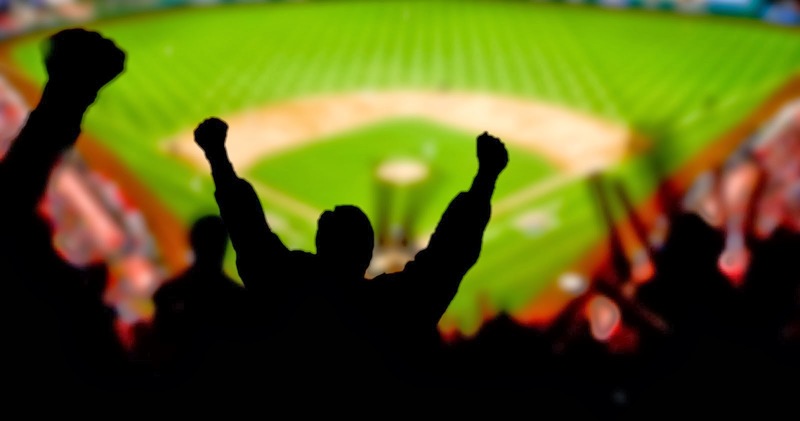 There has been some consternation over small caps, which have lagged in the past month. These worries are misplaced. First, RUT has outperformed SPX since Christmas and so far in 2019: it's not lagging. Second, the total market capitalization of RUT is less than the 6 largest companies in SPX; it represents a minor part of the stock market. 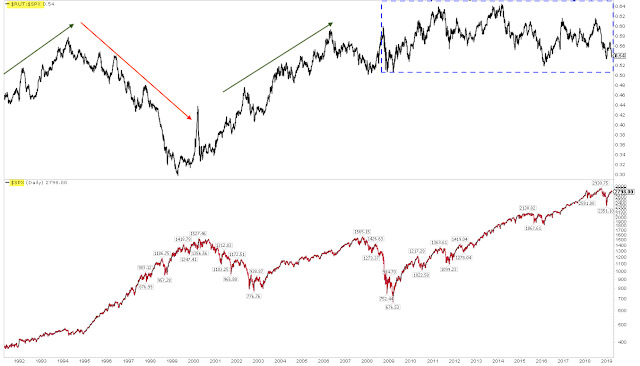 Consequently, RUT has rarely been a valuable tell for SPX: it lagged throughout most of the 1990s, outperformed during the 2000s and has been an equal performer to SPX the past 10 years (top panel). Whether it leads or lags hasn't made a difference. The situation in Europe has improved. Stoxx has exceeded its October-early December range and, for what it's worth, broken above a downtrend (dashed line). But Europe peaked way back in January 2018 and ATHs are still 7% higher. The situation is better, but it's still not great. On Monday, the SPX will have a "golden cross", whereby the 50-d crosses above the 200-d (arrows). This means the long term trend is improving. Over the past 40 years, a golden cross has only taken place within the context of a bull market when the low is already in place. The red arrow above occurred in December 2015. From that point, SPX gained 13% over the next 12 months but it corrected 12% first. A 12% correction is normal within any 12 month period but the timing, in this case, was tough. What does the good start to the year imply for 2019? More gains are very likely, but corrections along the way are also odds-on. 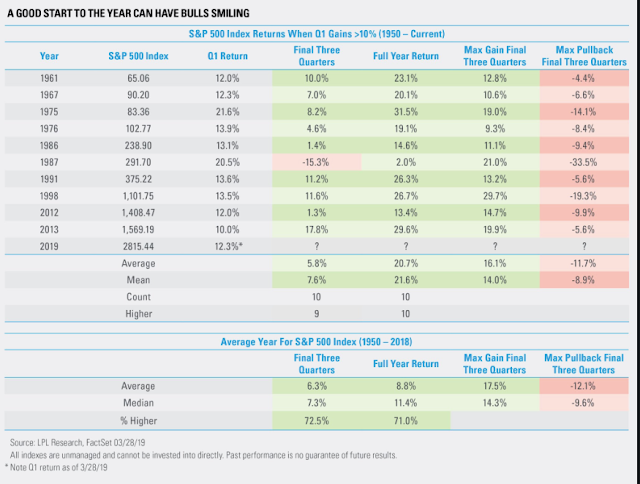 In the past 60 years, when SPX has gained more than 10% during 1Q, it has added to those gains into year-end 9 out of 10 times by a median of 8%. The one outlier was the infamous year of 1987. Still, maximum gains over the next 9 months were a minimum of 9% (from Ryan Detrick). In the far right column, note that pullbacks in the next 9 months have been a median of 9%. This is normal for any year, and the strong start doesn't reduce forward volatility. Risk/reward over the next 9 months is a bit less than 2:1. SPX has started the year by rising all 3 months. In the past 65 years, SPX closed higher either 6 or 12 months later every time. Its maximum gain over the next year was a minimum of 7%. Pullbacks in the next year were a median of 4%. 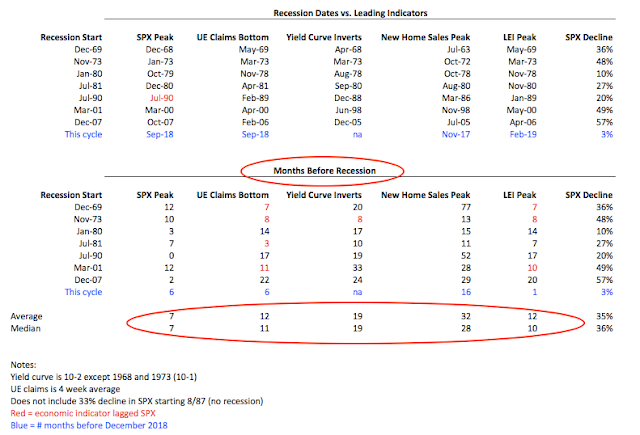 Risk/reward during this period was better than 3:1 (from Steve Deppe). 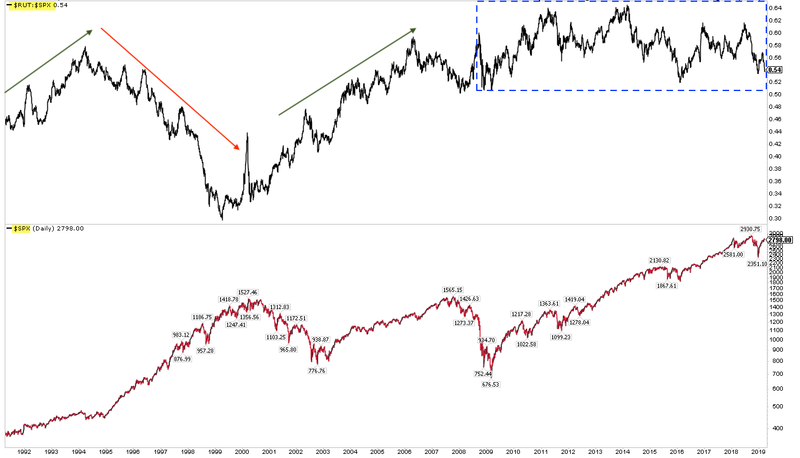 Will SPX continue to sail higher unabated? It's not likely: in the table above, note that within the next 3 months, SPX closed lower than at the end of March in 67% of instances. 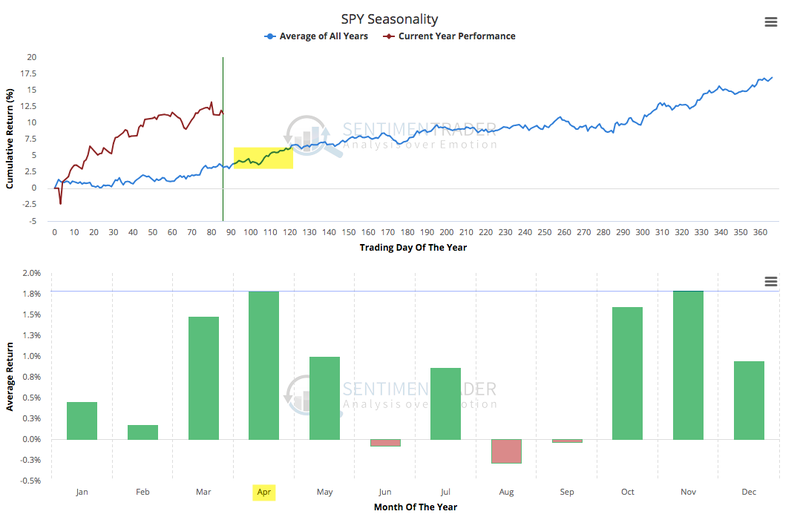 Instead of focusing on the first 3 months of the year, let's look at any 3 month period where SPX gained at least 20%. In the past 70 years, SPX has closed higher either 6 or 9 months later every time by a median of another 6% or 12%, respectively (from Thomas Lee). 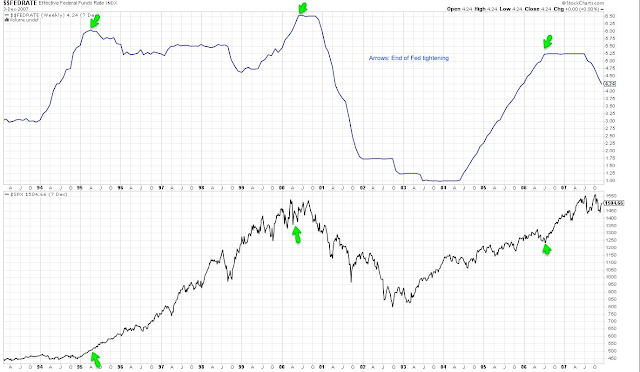 If past is prologue, SPX is likely to gain enough in the months ahead to make a new ATH. With the unfolding macro, corporate profitability, valuation and IPO environment, that will create a very exciting set up for the second half of 2019 and 2020. More on that when the time comes. 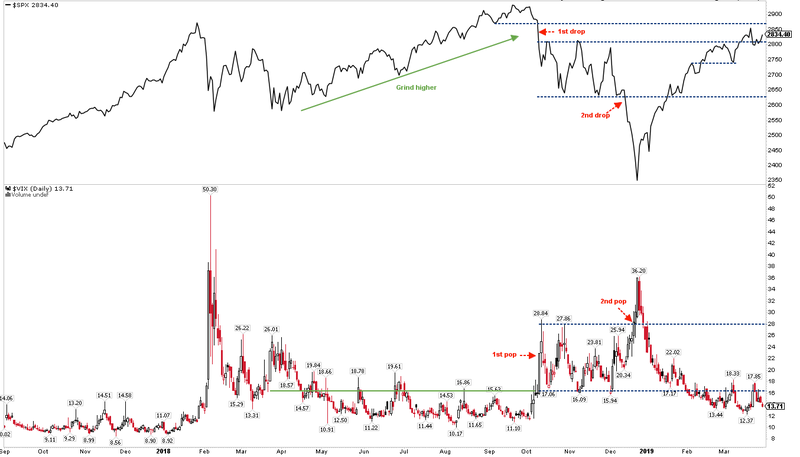 Will the interim pullback in SPX occur in April? Anything is possible, but it's not especially likely. April is usually an exceptionally strong month. 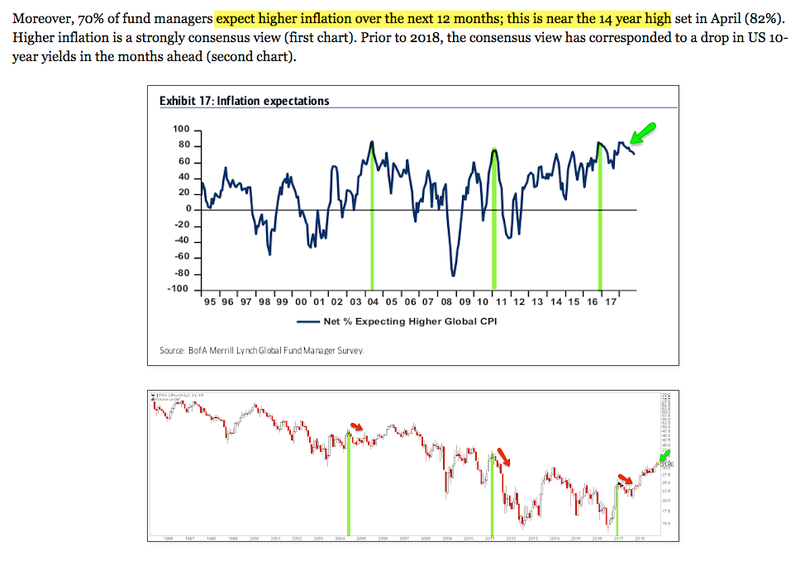 Over the past 30 years, April has been the strongest month of the year (from Sentimentrader; to become a subscriber and support the Fat Pitch, click here). In the past 70 years, April has been especially strong in the year before the next general election, gaining 95% of the time by an average of 3.5% (from Jeff Hirsch). On balance, investor sentiment is not an impediment to further equity gains. 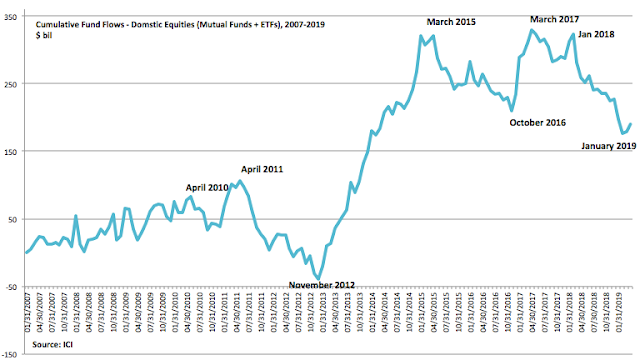 Fund managers' allocation to equities sank to their lowest level in 2-1/2 years in March. Their equity exposure is concentrated on defensives, like utilities. Their cash allocations are unusually high. 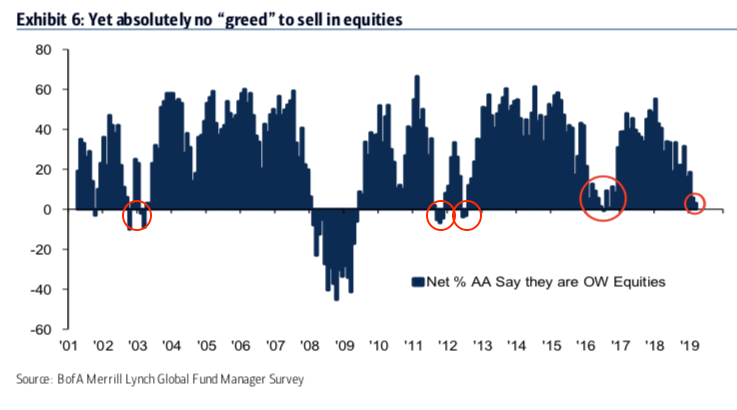 This is not the profile of greed (the next two charts are from BAML). Fund managers' equity allocations are now similar to those at equity lows in 2011, 2012 and 2016, and also at the bear market low in 2002-03. Of course, the bottom fell out in 2008. 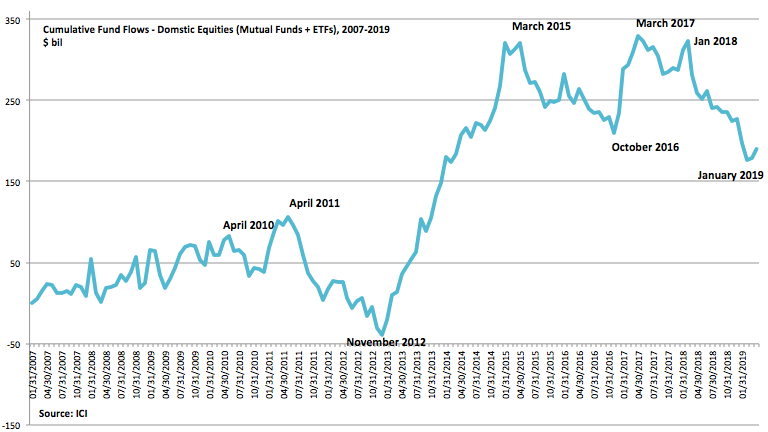 Domestic (US) equity fund flows (both mutual and ETFs) have been persistently negative the past year (from ICI). The same is true globally (from Scott Barlow). 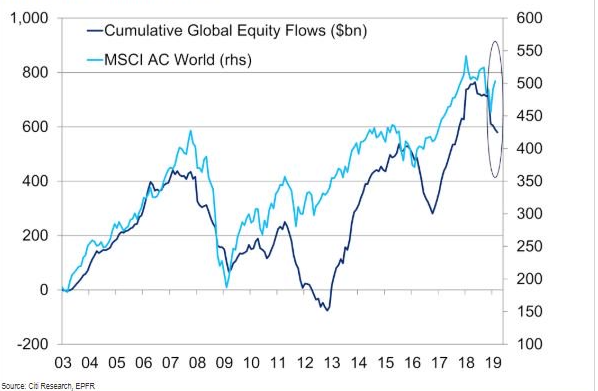 Money has instead flowed partly to the safety of money markets; balances have soared 10% in the past 4 months to their highest levels in 9 years (from Thomas Lee). 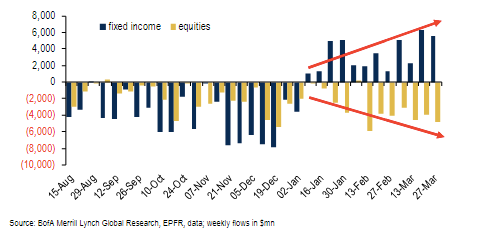 But the biggest inflows have been to bonds as investors have sought to lower risk. A reversal in these flows, from bonds and cash to equities, represents a significant potential tailwind in the months ahead (from Lisa Abramowicz). Part of the move to defense is rational. 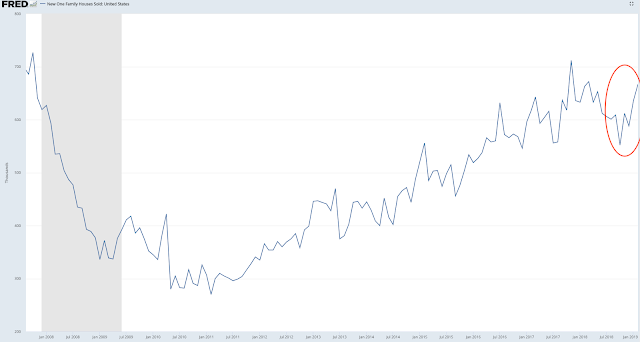 Unemployment remains low, but the trough in claims was probably 6 months ago. New home sales may have peaked 15 months ago. Retail sales in January grew a scant 1% yoy. 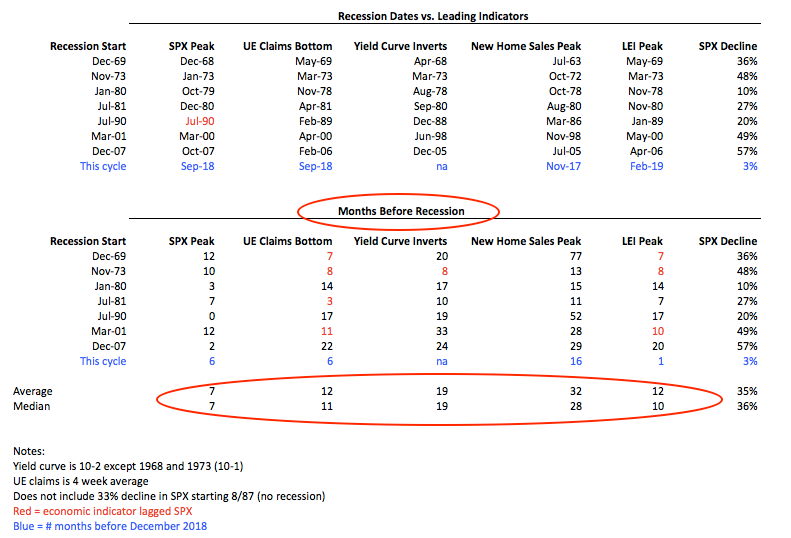 Many of these things lead recessions, and recessions and bear markets go hand in hand as our monthly macro summary table shows. It would be typical for employment and housing to have their cyclical high farther in advance of a top in SPX than what may have already occurred, but it is not unprecedented. The LEI also, on average, peaks 3-5 months ahead of SPX. It has never peaked more than 5 months after SPX, as might be the case now. LEI was at an ATH in February. The Fed, responding to this data, has paused its cycle of tightening and seems likely to end QT, at least for now. Given this macro data, and corporate profit margins that may well have peaked for this cycle (read here), a conservative investor with a shorter time horizon wouldn't be wrong to reduce their equity holdings into strength. But it seems more likely that investors have panicked. In December, the implied probability of a rate cut in 2019 was zero. 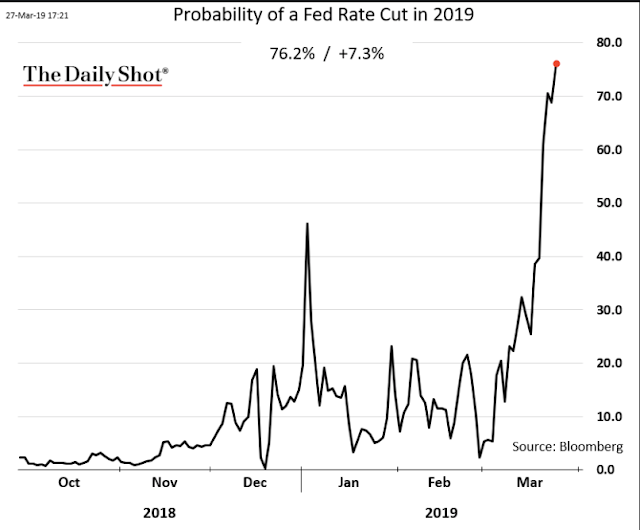 This week, it rocketed to 76% as expectations grow that the Fed will have to fend off a recession (from Daily Shot). In November, we warned that investors' inflation expectations were at an extreme (near a 14 year high) and that that has consistently led to a drop in treasury yields in the months ahead. In the event, the US 10-year has fallen from 3.2% to 2.4%. The drop in treasury yields is not, on its own, bearish for equities. Treasury yields have been falling for close to 40 years, during which equities have been mostly rising. 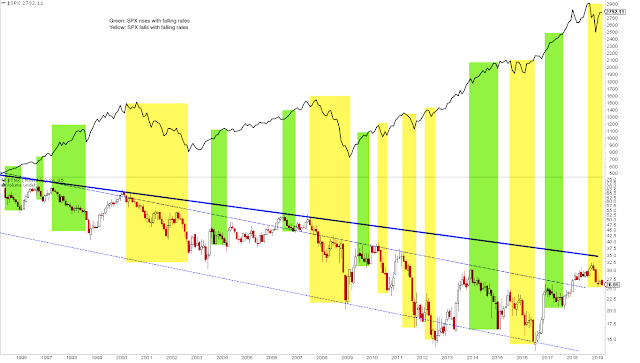 In the chart below, the green highlights are periods when yields fell and SPX rose; this has just as often been the case as yields falling with SPX (yellow highlights). Contrary to what is often believed, the bond market doesn't always know something before equities. The pause in the Fed's tightening is likewise neither bearish nor unusual. There have been 5 prior tightening cycles in the past 35 years (top panel) and the peak in SPX has come after the final rate hike each time. 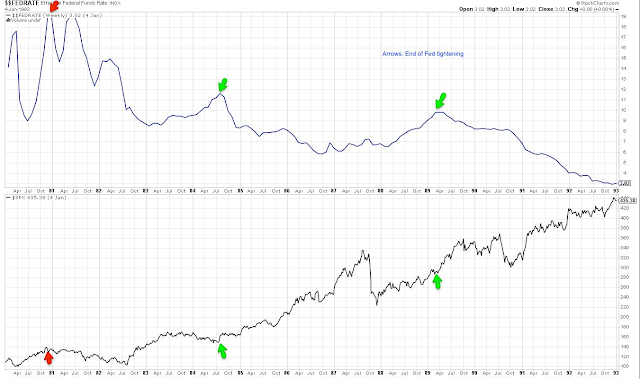 When the Fed has paused, stocks have continued to rise (bottom panel). 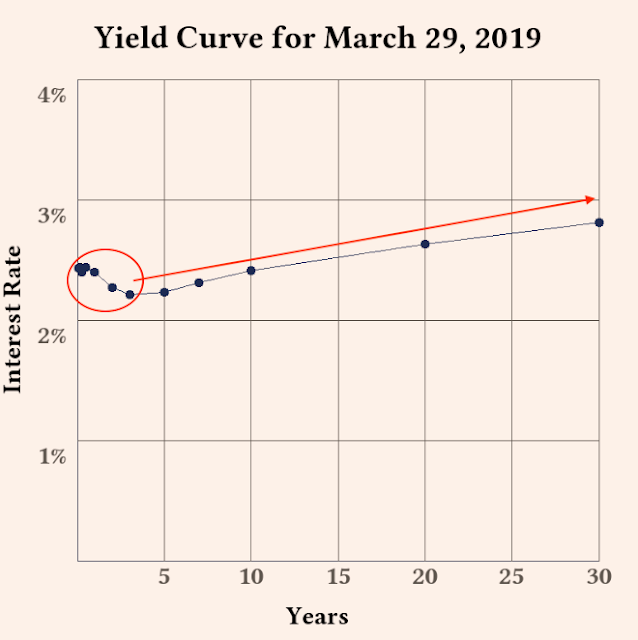 In the past week, the 10-year/3-month yield curve briefly inverted. Economists like to use this measure as a recession warning, but stock market investors should prefer to use the 10-year/2-year yield curve. Why? Because in the past 50 years it has inverted an average of 12 months before SPX has peaked, and it has always inverted before the 10-year/3-month curve (by an average of 9 months). Importantly, the 10-year/2-year curve has not inverted. More to the point, the inversion using the 3-month rate occurred because the Fed signaled a pause in tightening. That dropped very short term rates into inversion (circle). The curve from 2-years on out remains positive. This is not signaling sustained growth anxiety (the next two charts from Daily Yield Curve). 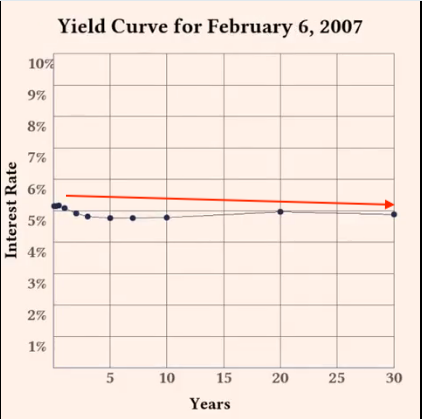 In comparison, the yield curve was inverted all the way out a half year before the SPX peaked in October 2007. This is a signal of sustained growth anxiety. In the past 40 years, SPX has continued to gain even after the 10-year/2-year curve inverted, most often by double digits (from Ryan Detrick). 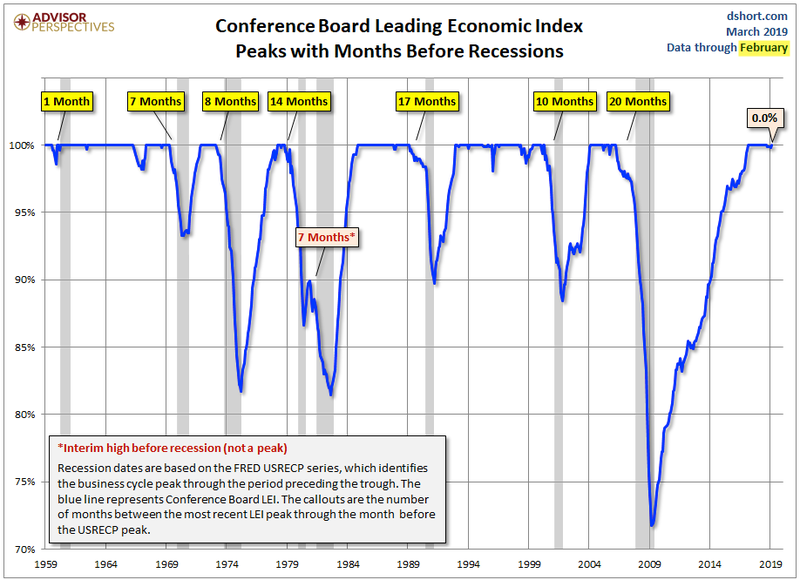 Finally, it seems likely that some of the macro data will rebound in the months ahead. 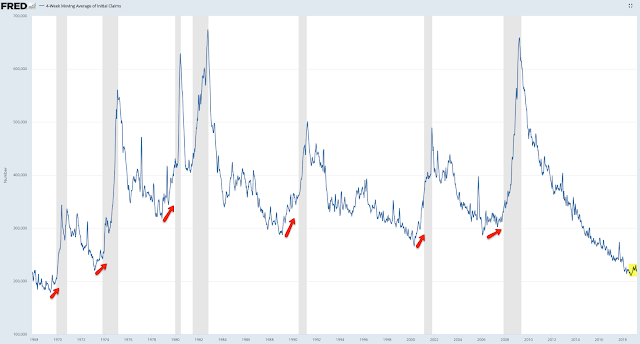 Housing, for example, peaked in late 2007 just as mortgage rates troughed, and then softened as rates rose during 2018. 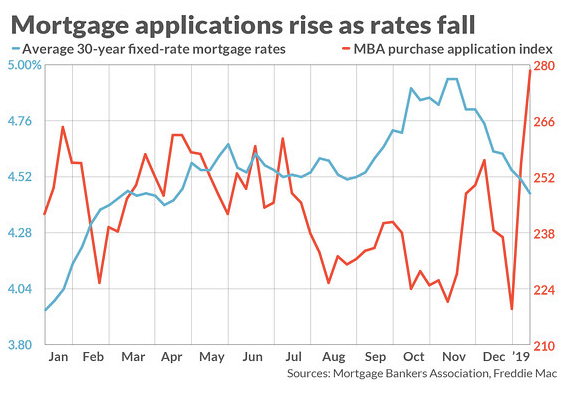 Rates have fallen from 5% in November to 4% this week, and purchase applications have soared (first chart, from MarketWatch). New home sales popped to their third highest level in 11 years last month, and have risen 11% in the past 6 months (second chart). The employment cycle may peaked but there has been no serious deterioration. This week's claims are less than 3% higher than the low in September. Into a recession, employment has had a sustained and pronounced period of weakening, something to watch out for in the weeks/months ahead. Equities are off to one of their best ever starts to a year, something that has consistently led to continued gains. 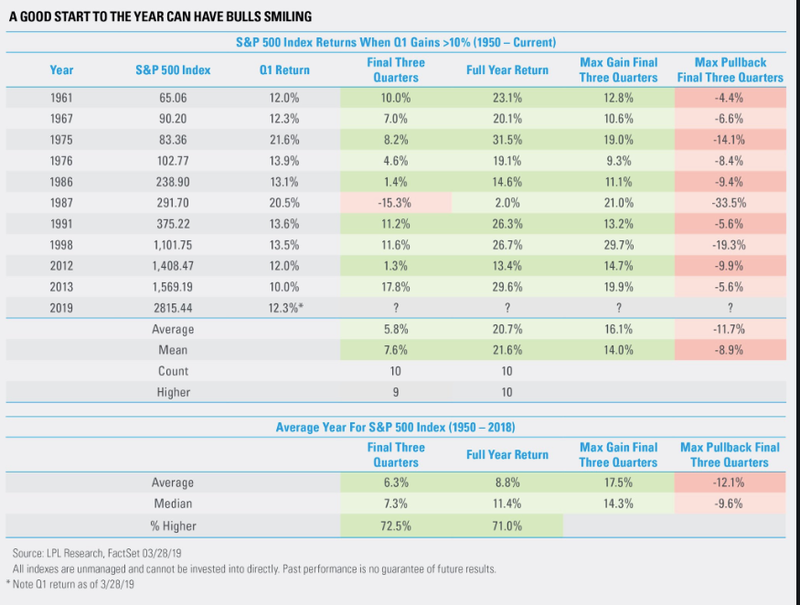 If past is prologue, SPX is likely to gain enough to make a new ATH in 2019. 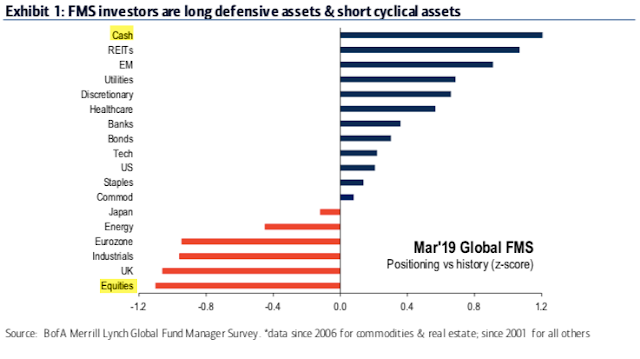 The panic over weakening macro is likely to abate and, with fund managers' risk exposure falling to a 2-1/2 year low this month, sentiment supports a continued rise in equities. 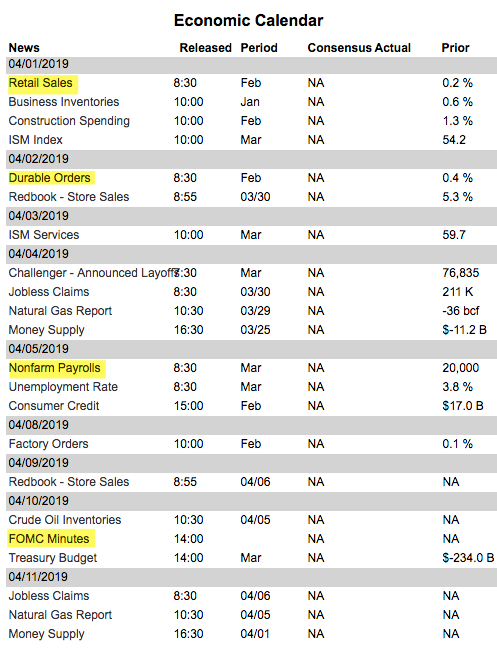 On the calendar this week: retail sales on Monday, durable goods on Tuesday and employment on Friday (from IBD Investors; for a trial subscription, please use this link).